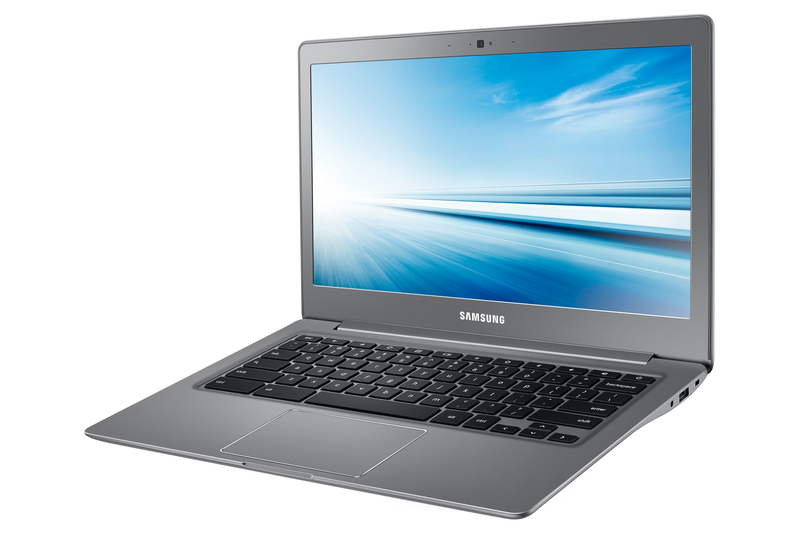 To properly go under the hood and hack around on a Samsung Chromebook 2, you’ll need to put it into developer mode. Whether using crosh or installing Chromium or other operating systems or just doing some pretty cool stuff, you’ll need to throw the thing into developer mode. Because you have so much control you should leave developer mode off when you’re not hacking around for security purposes. Note: Before you switch back and forth, know that user accounts will be reset each time you switch. Now, to enter developer mode, we’ll first go into recovery mode, using the Escape (ESC) and Refresh (F3) buttons on the keyboard when you press the Power button. When the Recovery screen comes up, use Ctrl-D to switch to developer mode and then when prompted, confirm and the device will reboot into developer mode (or dev-mode for the geeky). When you see the boot screen, wait 30 seconds to boot or just hit Control-D. To switch back to normal mode from developer mode use the crossystem command followed by disable_dev_request and set that to one and then reboot. To make this a shell one-liner: crossystem disable_dev_request=1; reboot And that’s it. Happy hackin’! In technology, we often find a lot of cool stuff that, as developers, engineers and yes, even product managers, we think is just plain cool. In agile development, we create epics, where we lay out customer stories and tie them into a set of features; however, while we’re working towards our goals we often find those technical places where we discover we can do something super cool. And we sometimes want to weave those into our stories as features in products simply because we want to make stuff that we’re technically proud of. But should we? Too often we don’t consider what the social ramifications are to features. Time and time again we hear stories of what seemed like a cool feature that got abused. When we’re creating software, we think of the art. We want to change the world after reading too much Guy Kawasaki. We want to build sometimes just for the sake of building. And sometimes we come to a place where we think we just have to add something into a product. Then we stop and think about it, and we come to a place where we’re just torn about whether that feature is something that should go back to the obscure place we found it. And in times like that, when we’re torn about what to do, we have to remember that “we are the goodpeople” and do what’s right. That is all. Before I post the new stencil, let me just show you how it came to be (I needed to do something, which required me to do something else, which in turn caused me to need to create this): Anyway, here’s the stencil. It’s version .1 so don’t make fun: AWS.gstencil. To install the stencil, download, extract from the zip and then open. When prompted, click on Move to move it to the Stencils directory. 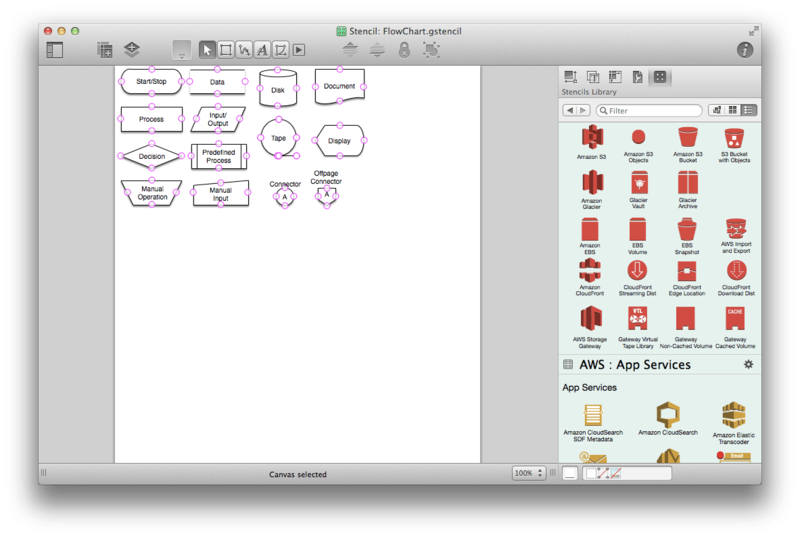 Reopen OmniGraffle and create a new object. 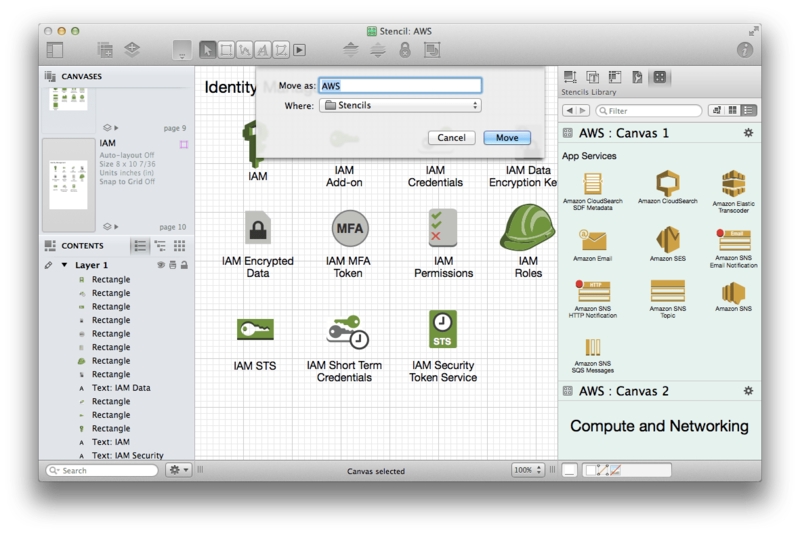 Under the list of stencils, select AWS and you’ll see the objects on the right to drag into your doc. Good luck writing/documenting/flowcharting! Especially in environments with files in Google Docs, Dropbox, Box, Wikis, file servers, portals and any other place that makes it hard to aggregate exactly what you need. Event Log: The messages from the dashboard under Monitor > Event log. Flows: Inbound and outbound traffic flows generate syslog messages that include the source and destination and port numbers. URL: HTTP GET requests generate syslog entries. Note that you can direct each type of traffic to a different syslog server. I had previously been using the gcutil command. But I cheated a little with the one liner promise to get the new tool, gcloud, installed: curl https://dl.google.com/dl/cloudsdk/release/install_google_cloud_sdk.bash | bash ; unzip google-cloud-sdk.zip ; ./google-cloud-sdk/install.sh The installation shell script is interactive and will ask if you want to update your bash profile. Once run, kill your terminal app and the new invocation will allow you to log into App Engine using the gcloud command followed by auth and then login: gcloud auth login Provided you’re logged into Google using your default browser, you’ll then be prompted to Accept the federation. Click Accept. 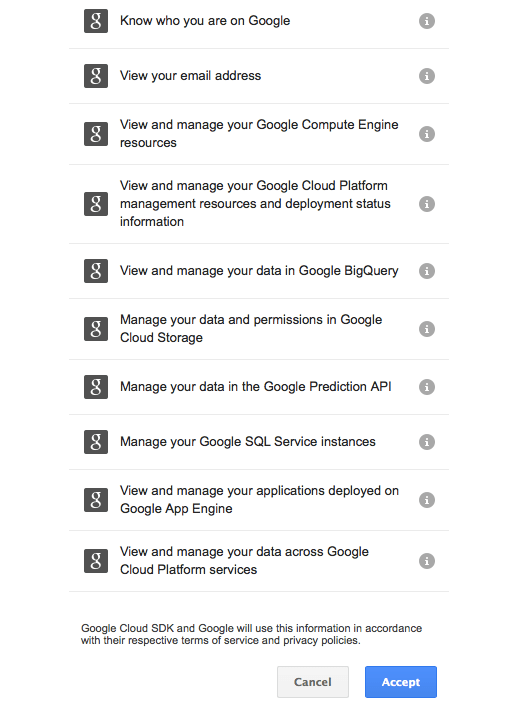 The gcloud command can then be used to check your account name: gcloud config list To then set a project as active to manage it, use the set option (or unset to not manage it any longer: gcloud config set project kryptedmuncas You can then use components, sql or interactive verbs to connect to and manage instances. Each of these commands are interfacing with the API, so if you ever find that you’ve exceeded what this simple command provides for, you can always hit the API directly as well. I found that the interactive command was my favorite as I could figure out what limitations I had using interactive and then try and figure out how to accomplish tasks with commands from there. Microsoft Azure is Microsoft’s cloud services. 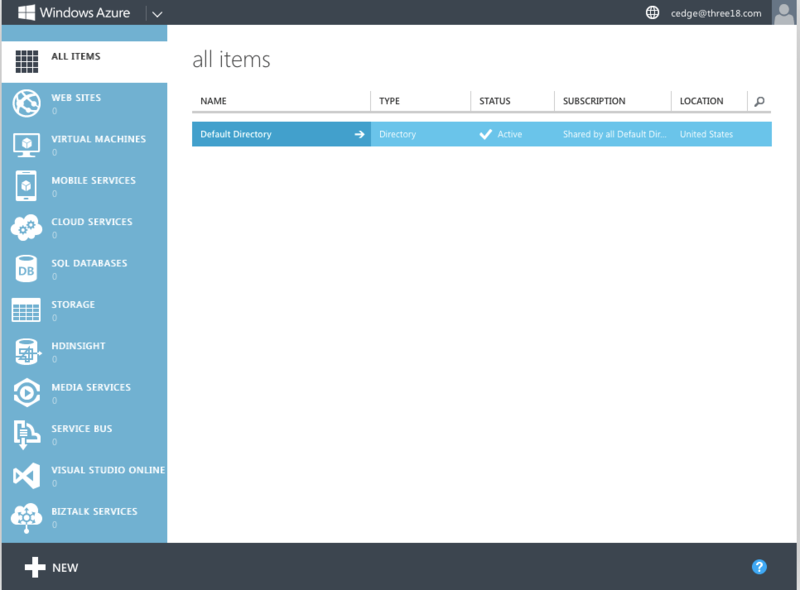 Azure can host virtual machines and act as a location to store files. However, Azure can do much more as well, providing an Active Directory instance, provide SQL database access, work with hosted Visual Studio, host web sites or provide BizTalk services. All of these can be managed at https://manage.windowsazure.com. You can also manage Windows Azure from the command line on Linux, Windows or Mac. 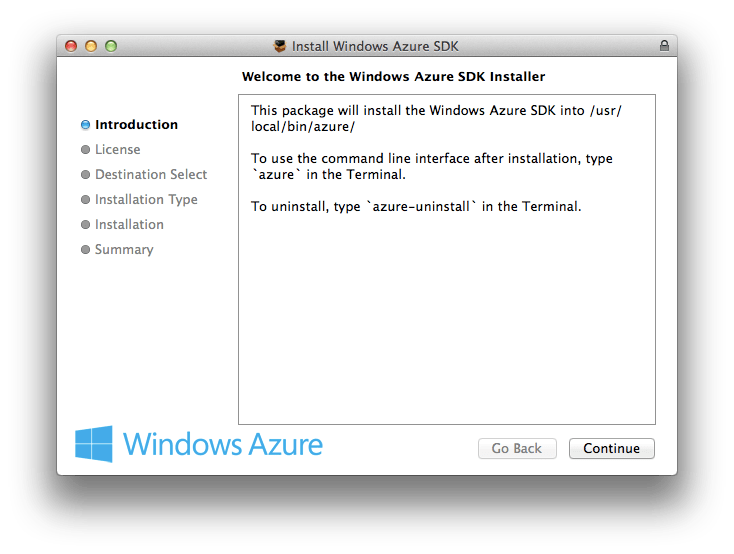 To download command line tools, visit http://www.windowsazure.com/en-us/downloads/#cmd-line-tools. Once downloaded, run the package installer. When the package is finished installing, visit /usr/local/bin where you’ll find the azure binary. Once installed, you’ll need to configure your account from the windowsazure.com site to work with your computer. To do so, log into the windowsazure.com portal. Once logged in, open Terminal and then use the azure command along with the account option and the download verb: azure account download This account downloads the .publishsettings file for the account you’re logged in as in your browser. Once downloaded, run azure with the account option and the import verb, dragging the path to your .publishsettings file from https://manage.windowsazure.com/publishsettings/index?client=xplat: azure account import /Users/krypted/Downloads/WindowsAzure-credentials.publishsettings The account import then completes and your user is imported into azure. Once imported, run azure with the account option and then storage list: azure account storage list You might not have any storage configured yet, but at this point you should see the following to indicate that the account is working: info: No storage accounts defined info: account storage list command OK You can also run the azure command by itself to see some neat ascii-art (although the azure logo doesn’t really come through in this spiffy cut and paste job): info: _ _____ _ ___ ___________________ info: /_\ |__ / | | | _ \ __| info: _ ___ / _ \__/ /| |_| | / _|___ _ _ info: (___ /_/ \_\/___|\___/|_|_\___| _____) info: (_______ _ _) _ ______ _)_ _ info: (______________ _ ) (___ _ _) info: info: Windows Azure: Microsoft's Cloud Platform info: info: Tool version 0.7.4 help: help: Display help for a given command help: help [options] [command] help: help: Open the portal in a browser help: portal [options] help: help: Commands: help: account to manage your account information and publish settings help: config Commands to manage your local settings help: hdinsight Commands to manage your HDInsight accounts help: mobile Commands to manage your Mobile Services help: network Commands to manage your Networks help: sb Commands to manage your Service Bus configuration help: service Commands to manage your Cloud Services help: site Commands to manage your Web Sites help: sql Commands to manage your SQL Server accounts help: storage Commands to manage your Storage objects help: vm Commands to manage your Virtual Machines help: help: Options: help: -h, --help output usage information help: -v, --version output the application version Provided the account is working, you can then use the account, config, hdinsight, mobile, network, sb, service, site, sql, storage or vm options. Each of these can be invoked along with a -h option to show a help page. For example, to see a help page for service: azure service -h You can spin up resources including sites, storage containers and even virtual machines (although you might need to create templates for VMs first). As an example, let’s create a new site using the git template: azure site create --git Overall, there are a lot of options available in the azure command line interface. The web interface is very simple, with options in the command line interface mirroring the options in the web interface. Running and therefore scripting around these commands is straight forward. I wrote up some Amazon stuff previously at http://krypted.com/commands/amazon-s3cmd-commands, but the azure controls are really full featured and I’m really becoming a huge fan of the service itself the more I use it (which likely means I’ll post more articles on it soon). If you ever loose track of the password on your Chromebook, find that the Chromebook is running oddly or want to sell a Chromebook, you can remove your Google account and readd it. The easiest way to do this is a feature called Powerwash. To pull it up, open Settings and then click on Advanced Settings. There, you’ll see the Powerwash button. Click it and then you will remove all of the user accounts installed on the device, basically performing a factory reset. Powerwash can also be run by clicking Restart while holding down Control-Alt-Shift-R at the login screen. This brings up a Powerwash prompt where you simply need to click Powerwash to remove your data. The first time you login once the Powerwash process is complete, your apps and data start to sync back to the Chromebook.